The Baker Hughes U.S. rig count was up 18 this week to 1,914. 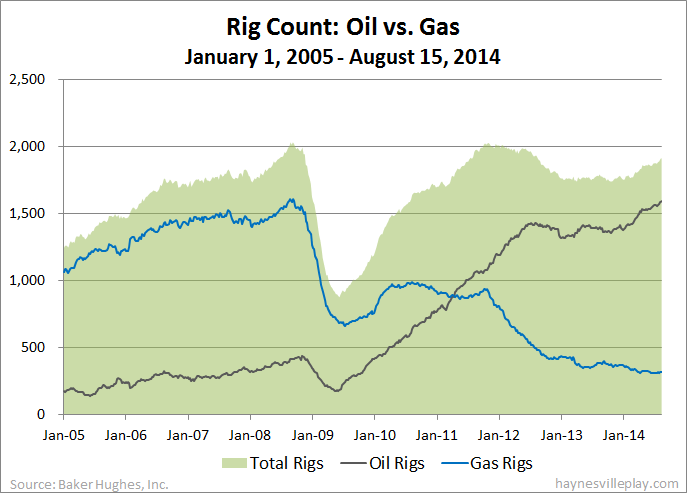 Oil rigs were up 11 to 1,575, gas rigs were up eight to 338 and miscellaneous rigs were down one to one. By type, horizontal rigs were up nine to 1,330, vertical rigs were up eight to 374 and directional rigs were up one to 210. Among gas rigs, horizontal rigs were up six to 248, directional rigs were up two to 65 and vertical rigs were unchanged at 25. The EIA reported that working gas in storage was up 75 Bcf to 2.63 Tcf. The weekly injection was 15% above last year (+65 Bcf) and 29% greater than the five year average (+58 Bcf). The current storage level is now 15.7% below last year (3.12 Tcf, a difference of 490 Bcf) and 16.5% below the five year average (3.148 Tcf, a difference of 518 Bcf). 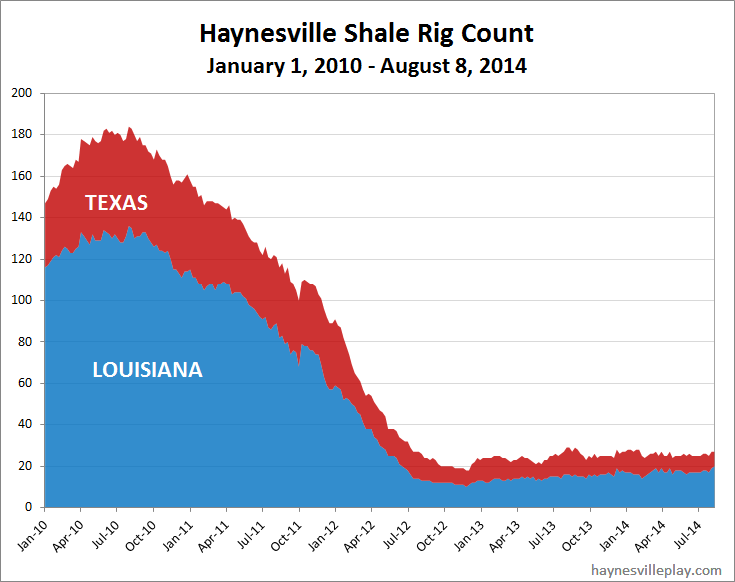 The Haynesville Shale rig count was up one this week to 27. Louisiana was up one to 20 (J-W), while Texas held at seven. The Baker Hughes U.S. rig count was down 17 rigs this week to 1,896. Oil rigs were down 25 to 1,564, gas rigs were up nine to 330 and miscellaneous rigs were down one to two. By type, horizontal rigs were down eight to 1,321, vertical rigs were down two to 366 and directional rigs were down seven to 209. Among gas rigs, horizontal rigs were up seven to 242, directional rigs were up one to 63 and vertical rigs were up one to 25. The EIA reported that working gas in storage was up 88 Bcf last week to 2.555 Tcf. The weekly injection was 52% above last year (+58 Bcf) and 83% greater than the five year average (+48 Bcf). The current storage level is now 16.4% below last year (3.055 Tcf, a difference of 500 Bcf) and 17.3% below the five year average (3.090 Tcf, a difference of 535 Bcf). 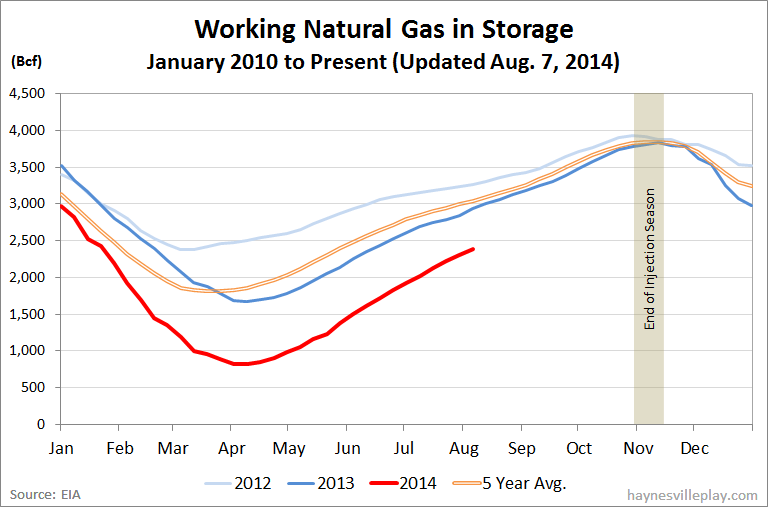 As the chart below shows, the 2014 storage deviation from the five year average (red line) continues to be a mirror image of the same data from 2012 (light blue line) when a warm winter badly shocked the storage numbers and crushed natural gas prices. The Haynesville Shale rig count was down one this week to 26. Louisiana was down one (J-W Operating) to 19, while Texas held at seven. And (for those of you with children who can sing the entire soundtrack from the movie "Frozen") for the first time in forever, I have updated the rig map. This week's Baker Hughes U.S. rig count was up five to 1,913. Oil rigs were up one to 1,589, gas rigs were up five to 321 and miscellaneous rigs were down one to three. By type, horizontal rigs were up 12 to 1,329, vertical rigs were down ten to 368 and directional rigs were up three to 216. Among gas rigs, horizontal rigs were up five to 235, directional rigs were up one to 62 and vertical rigs were down one to 24. Blackstone Group, LP announced today that it has acquired Royal Dutch Shell's Haynesville Shale interests for $1.2 billion. Shell sold its rights to 107,000 net acres prospective for the Haynesville Shale that it owned as a JV partner of Encana. Blackstone, which is a ginormous investment entity that is best known for its private equity operations, acquired the acreage through its subsidiary Blackstone Energy Partners in partnership with operator Vine Oil and Gas. Vine is a Dallas-based company that was set up by Blackstone earlier this year with the intent of developing shale assets and is operated by a former Encana executive, Eric Marsh. Mr. Marsh is likely familiar with the quality of the Haynesville assets from his Encana days. Look for more deals from this partnership and others. These are good times for private equity firms and independent operators to sweep up cast-off assets at reasonable prices. At approximately $11,215 per acre for proven Haynesville acreage, I'd say Blackstone did alright. As part of its yard sale, Shell also sold off assets in the Wyoming Pinedale to Ultra Petroleum in exchange for $925 million cash and 155,000 acres in the Marcellus and Utica Shales. 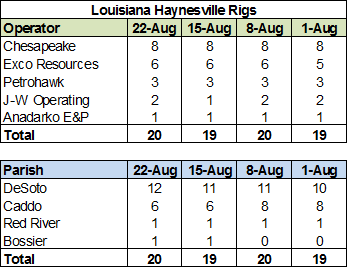 The Haynesville Shale rig count was unchanged at 27, but EXCO Resources moved its only Texas rig to Louisiana. 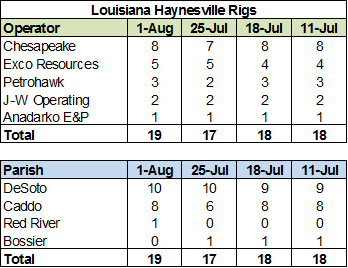 Louisiana now has 20 Haynesville rigs working - its highest level since June 15, 2012, the tail end of the Great Rig Count Crash of 2012 - and Texas is down to seven. 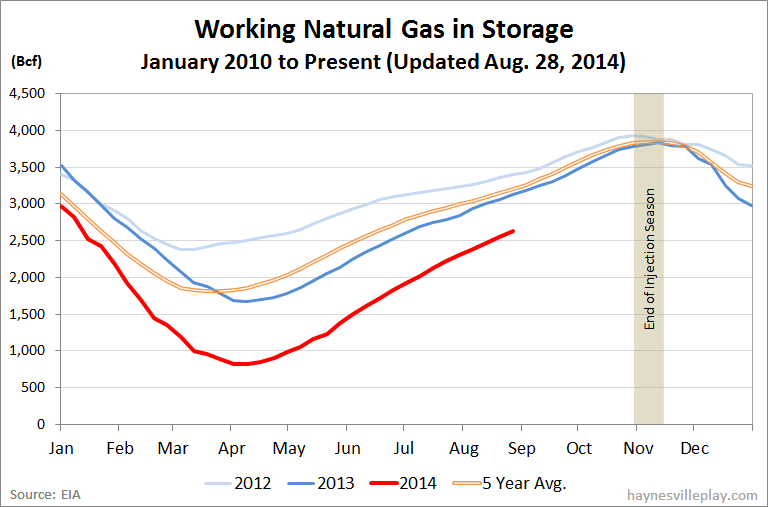 This morning, the EIA announced that working gas in storage was up 78 Bcf to 2.467 Tcf. The weekly injection was 11% above last year (+70 Bcf) and 73% greater than the five year average (+45 Bcf). The current storage level is now 17.7% below last year (2.997 Tcf, a difference of 530 Bcf) and 18.9% below the five year average (3.042 Tcf, a difference of 575 Bcf). The Baker Hughes U.S. rig count was up 19 last week to 1,908. Oil rigs were up 15 to 1,558, gas rigs were up three to 316 and miscellaneous rigs were up one to four. By type, horizontal rigs were up 19 to 1,317, vertical rigs were up five to 378 and directional rigs were down five to 213. Among gas rigs, horizontal rigs were up one to 230, directional rigs were down five to 61 and vertical rigs were up seven to 25. The Wall Street Journal reported this morning that massive private equity company Blackstone Group LP is in negotiations to buy Shell's Haynesville Shale interests for around $1 billion. Shell, known as SWEPI, LP in the Haynesville, entered the play as Encana's HV partner in 2007, a rare early entrance to a developing shale play for an energy major. By my count, Shell has completed 179 Haynesville wells, all in Louisiana (through mid-June), with their first completion in March 2009, but the company hasn't operated a Haynesville rig since April 2014. This is the first big Haynesville deal in a while (assuming it gets done), but it follows Shell's corporate mandate to shed domestic shale assets and cut back on other domestic investments. Shell has a long presence in Louisiana, but late last year it cancelled its planned south Louisiana gas-to-liquid plant, which likely would have been fed by Haynesville gas. This created questions as to whether the company's Haynesville would now be orphaned within the company or sold. The EIA reported this morning that working gas in storage was up 82 Bcf to 2.389 Tcf. The weekly injection was 9% below last year (+90 Bcf) but 67% greater than the five year average (+49 Bcf). The current storage level is now 18.4% below last year (2.927 Tcf, a difference of 538 Bcf) and 20.3% below the five year average (2.997 Tcf, a difference of 608 Bcf). The Haynesville Shale rig count was up two last week to 27. Louisiana was up two (Chesapeake and Petrohawk/BHP) to 19, while Texas held at eight. The Baker Hughes U.S. rig count was up six this week to 1,889. Oil rigs were up 11 to 1,573, gas rigs were down five to 313 and miscellaneous rigs were unchanged at three. By type, horizontal rigs were up five to 1,298, vertical rigs were up 12 to 373 and directional rigs were down 11 to 218. Among gas rigs, horizontal rigs were down three to 228, directional rigs were up two to 66 and vertical rigs were down four to 18.